Since 1 January 2002, the euro coin series in circulation in the eurozone has included eight different denominations: 1 and 2 euros, and 1, 2, 5, 10, 20 and 50 cents. The €2, €1, and the 50, 20 and 10 cent coins feature the European Union before the 1 May 2004 enlargement; from 1 January 2007 they feature a geographic image of Europe. The 5, 2 and 1 cent coins show Europe in relation to Africa and Asia on a globe. 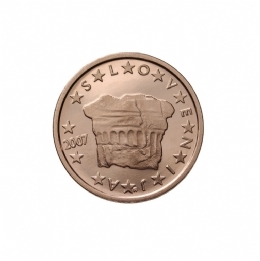 The Slovenian euro coins have 8 different motifs on the national side that symbolically represent part of Slovenian history and culture. Every coin has 12 stars around edge interspersed with letters spelling “SLOVENIJA”. 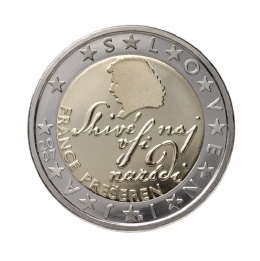 The 2 euro coin features a profile of the national poet France Prešeren, and a line from his poem Zdravljica, which is also the national anthem, in his own hand. 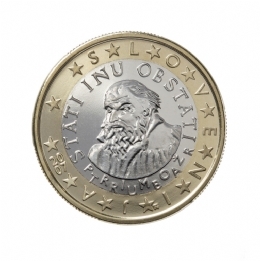 The 1 euro coin is a thumbnail portrait of Protestant Reformer Primož Trubar, with the inscription "stati inu obstati" (to stand and withstand). 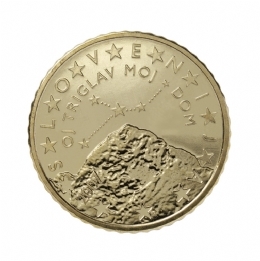 Mount Triglav, Slovenia's highest mountain, the constellation of cancer and the inscription "Oj Triglav Moj Dom" (O Triglav, my home) features on the 50 cent coin. 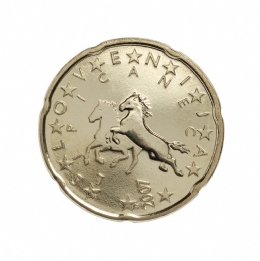 Two horses and the inscription "LIPICANEC" (Lipizzaner horse) feature on the 20 cent coin. 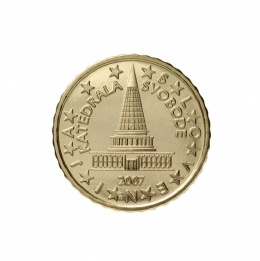 The 10 cent coin features the inscription "Katedrala Svobode" (Cathedral of Freedom) and the unrealised plan for a national parliament designed by architect Jože Plečnik. A sower, a frequent artistic motif sowing seeds (stars and points), is the central motif of the 5 cent coin. The 2 cent coin features the Prince’s Stone, where Karatanian dukes were enthroned. 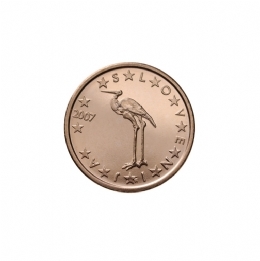 A stork is featured on the 1 cent coin. 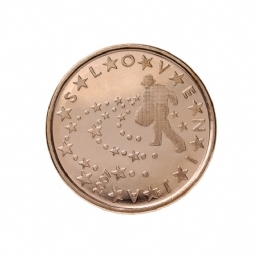 The designers of the Slovenian euro coin obverses were Miljenko Licul and assistants Maja Licul and Janez Boljka. More about coins on ECB web site.